I love a good sweet bread. Who doesn’t? Especially when it’s super moist on the inside and has a really thick crunchy top. This bread has definitely got that… and more! Take a peek inside and you’ll find a thick ribbon of cream cheese. 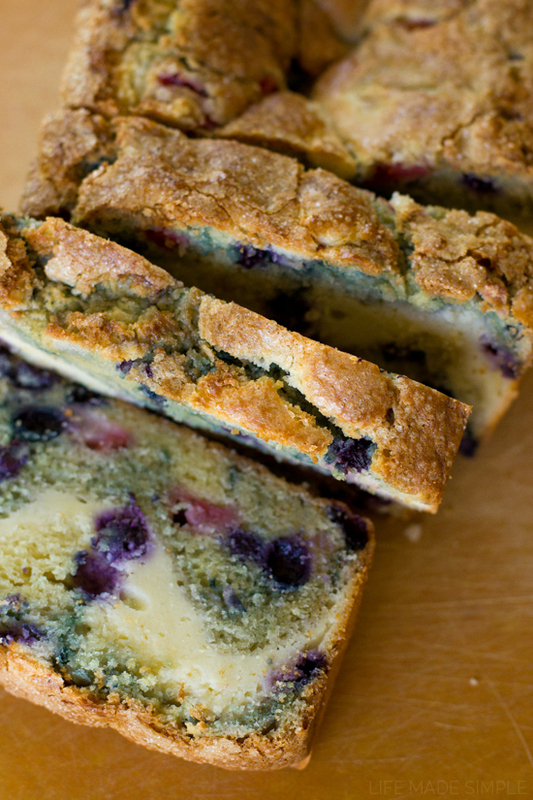 It’s what takes this red, white & blueberry bread to a whole new level of yum! A few weeks ago our local grocery store was having a huge promo on berries. I couldn’t resist snatching up a few cartons of raspberries, strawberries and blueberries. We ate about 90% of them but as the week went on we had other ripe fruit out on our counters and completely neglected the berries in the fridge. Stephen ate the raspberries and I used the blueberries in my oatmeal, but we had a handful of strawberries that needed a little extra tlc. That’s when I decided to make this beautiful red, white & blueberry bread (corny, I know) or strawberry cream cheese bread with blueberries. As soon as I was gathering up ingredients I couldn’t help but feel silly for using up the fresh blueberries in my oatmeal. If you’re wondering why the bread looks a little funky in spots, it’s because the frozen blueberries colored the batter when I folded them in. If it bothers you, stick with fresh, not frozen berries. Anyway, I couldn’t help resist making this sort of “patriotic” if you will. I’m not the biggest fan of white chocolate so I whipped up a cream cheese batter to create that lovely little swirl. Best idea ever. Trust me, it’ll have you wanting to add cream cheese to all of your sweet breads. It’s addictive. Speaking of addictive. I think we gobbled up this bad boy in just 2 days. The hubby was just as obsessed with it as I was. That’s kind of a big deal around here. But enough jibber jabber, let’s get baking! To start, toss in all of the ingredients for the cream cheese swirl into one smallish mixing bowl. If your cream cheese is at room temperature (or has sat out for at least 20 minutes) you should be good. Mix it all up and get it nice and smooth, then set it aside. For the bread batter, start by creaming the butter, sugar, cream cheese, vanilla and lemon zest until it’s light and fluffy. Side note: I always add vanilla and zest to the bowl before creaming, I think it helps enhance the flavor in the recipe. Now add the eggs and then let it stand while you whisk together the dry ingredients in a separate bowl. Whisking (or sifting) is essential in all recipes! Or at least in my opinion. It evenly distributes ingredients, adds air to them and ultimately creates a better baked goods [end rant]. Incorporate the dry ingredients until you can’t see anymore streaks of flour, then fold in the fruit by hand. Add half of the batter to the prepared loaf pan, then pour the cream cheese over the top. If you want to get fancy you can use a knife to swirl it in a bit, but I left mine alone and it swirled on its own. Pour the remaining batter on top of the cream cheese layer and then smooth it out with a spatula or by gently shaking the pan back and forth and side to side. Finally add a sprinkle of coarse sugar on top. I used Zulka® Morena® pure cane sugar. Not only is it less processed, but it has more natural flavor and sweetness to it. It’s a great alternative to cane, sanding and turbinado sugar. Bake for 50-60 minutes or until the top is set and a cake tester comes out clean. 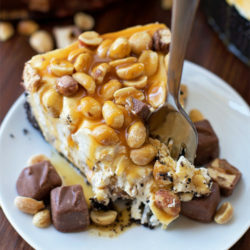 Let it cool and then slice it up and enjoy! 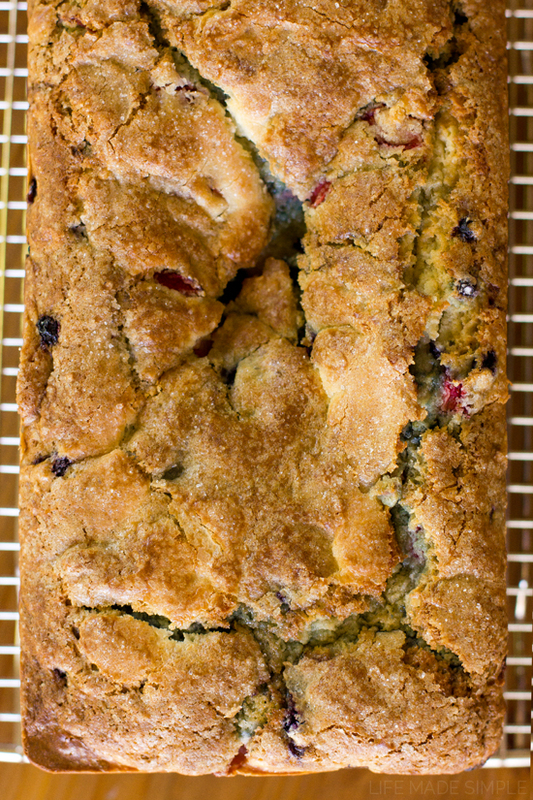 I can’t tell you enough how good this red, white & blueberry bread is! We’re smitten! Bursting with berries and cream cheese, it doesn’t get much better than this! 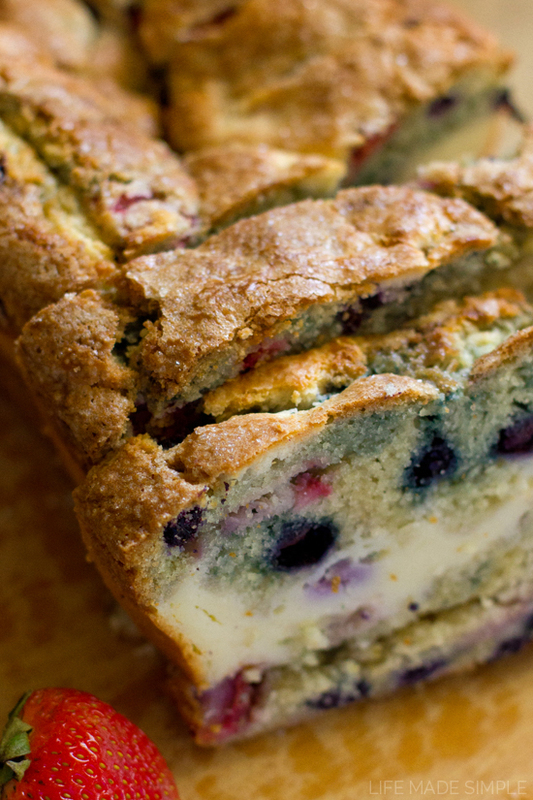 This moist red, white & blueberry bread is loaded with fruit and tangy cream cheese. 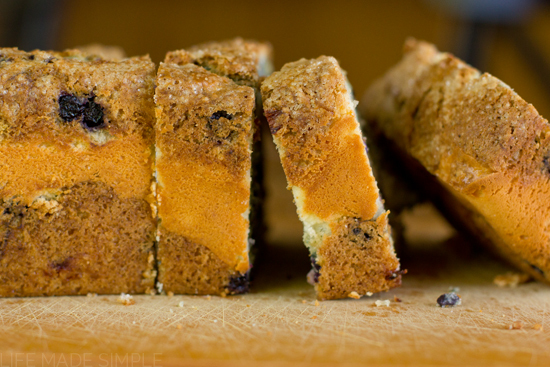 With a crunchy top and sweet interior, you can't go wrong! Preheat oven to 350 degrees. Spray or line a 9x5 inch loaf pan, set aside. In a small mixing bowl combine all of the ingredients for the cream cheese swirl. Using a hand mixer blend until smooth, set aside. In the bowl of a stand mixer, cream the butter, sugar, cream cheese, vanilla and lemon zest until light and fluffy, about 2-3 minutes. With mixing speed on low, add eggs one at a time until incorporated. In separate mixing bowl, whisk together the flour, baking powder, baking soda and salt. With mixing speed on low, gradually alternate adding the dry ingredients and milk, mixing just until no flour pockets remain. Remove the bowl from the stand and fold in the fruit. Pour half of the batter for the bread into the prepared loaf pan. Then pour the cream cheese "swirl" on top. You can either leave it as-is or carefully swirl it with a knife. Pour the remaining batter over top and sprinkle with coarse sugar if desired. Place in the oven and bake for 50 to 60 minutes or until the center of the loaf is set. You may need to tent the loaf with foil if the top is getting too brown (around the 40-50 minutes). Remove from the oven, allow to cool in the pan for 30 minutes, then turn onto a wire rack to cool completely. 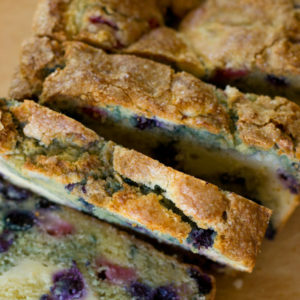 -If using frozen blueberries, coat them in flour before mixing them in. Mine were very moist and left swirls of blue/grey in my bread. You can avoid this altogether by using fresh blueberries. I love when berries are on sale! I always go crazy!! This bread looks amazing, and I love the festive twist. That cream cheese swirl looks soooo good! Hope you have a great holiday weekend! I just got done baking this: the ingredients list says milk, but it isn’t mentioned anywhere in the recipe or the description of how you made it!! I failed to realize this until I was about to fold in the fruit, so I just decided to mix the milk in at that point and hope for the best. It took a really, really long time to bake, and I would have been better off dividing the mixture into two loaf pans–my mixture was spilling out into my oven as it baked. Otherwise, it turned out yummy!! Oh no! I’m sorry about that! Somehow I totally forgot to add that in the directions, thanks for letting me know! 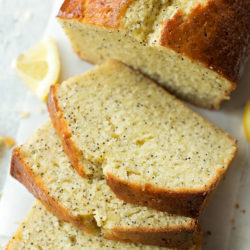 Did you use a 9×5 loaf pan? I didn’t have any trouble with mine overflowing. 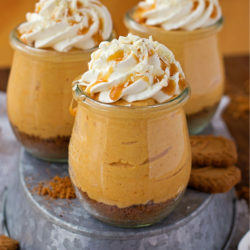 Really lovely recipe, not too sweet and the cream cheese swirl was delicious. I didn’t use strawberries as they’re out of season here so used all blueberries and it worked really well. It did take a really long time to cook – probably close to 1 hour 45 minutes. I checked it every 10 minutes after it had been cooking for the first 50. Apart from that, for someone who doesn’t bake often, I thought it turned out great! Made this few days ago. Yes my batter came up and almost spilled out of my loaf pan. I agree about dividing it into 2 pans which also might reduce baking time, it took almost 2 hours to bake. I think the cream cheese filling increases the baking time because every time I checked bread was jiggly , definitely tent it after browning. I used organic cane sugar on top. It tasted Great! I had trouble getting loaf out because it did bake over the rim of pan so could not slice too pretty but everyone loved it anyway. Will definitely make again. Thanks for the recipe! Forgot to rate the stars..
I’d suggest refrigerating it and then taking out the morning of to let it home to room temperature. I don’t think it’d make anyone sick, but because it’s summer and it’s a fruit-filled bread, it will probably stay fresher in the refrigerator.